For more tips on creating with the Burst of Spring collection watch the tutorial at https://youtu.be/_8WJPTKIUlQ. Instructions: Finished size of card is 6" x 6". Cut base of card from white cardstock to make a 6" x 6" square card. Cut a 6" x 6" card panel from designer paper, use a Cut Mat Create coordinating die to cut the center image. Ink edges of paper with deep purple ink. 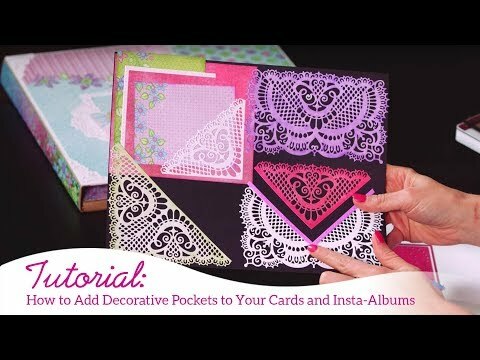 Cut 2 decorative borders from violet cardstock with die from Decorative Pocket Accents. Glue panel to base of card, glue borders as pictured, glue center image with foam dots. Cut a decorative frame from purple cardstock with die from Butterfly Kisses set, glue to center image as pictured. Stamp teacup image on watercolor paper with VersaMark ink 3 times, heat emboss with gold embossing powder. Cut all images with coordinating die. 1-image complete, 1-image remove teacup from flowers with scissors, 1-image use small coordinating flower die to cut 2 center flowers. Color all images with watercolor paints. Shape slightly on the back with large tip from flower shaping kit. Glue all pieces together with foam dots for dimension. Glue to front of card with foam dots as pictured. Stamp pansy flowers on white cardstock, 1-small with violet ink, 2-small with deep purple ink. Stamp leaves on white cardstock with bamboo leaves ink. Cut with coordinating dies. Color with same inks as stamped, adding a touch of sunflower (yellow) color to centers of flowers. Lightly spray all pieces with water on back of images and place on shaping mold facing down. Shape and remove from mold. Assemble flowers, glue leaves and flowers to card as pictured. Add prills to center of flowers.